Let's try a little test: sit back, breathe in and try and read the rest of this piece without being pulled away by a group chat, an email or, heaven forbid, a conversation in the real world. Just over a decade ago, that wouldn't have presented too great a challenge. But in an age where being tugged in 14 different directions at any given time is part of the daily norm, relatively simple work tasks can routinely take twice as long, and staying in contact with friends can often feel overwhelming. And, as we all know, it's simply not a practical option to cut technology out of our lives in order to combat the incessant prompts. But fighting back against this age of digital distraction is a Cambridge startup, Foci AI, whose clip-on wearable promises to help train your mind to remain more centred. Through the power of motion sensors and machine learning, the device will track your breathing patterns and develop a picture of your cognitive state to make you more aware of your focus levels. Currently doing the rounds on Kickstarter, Foci is available from $59, with shipments expected to begin in October. "When I was at university, like everybody else, I would find myself getting distracted when sat down trying to study. And I began looking at psychological techniques that could help combat procrastination and just get into focus much quicker," Foci AI founder Mick Adams tells us. "From there, I just realised this much bigger problem – and that's an addiction to technology. I was addicted to my phone, constantly checking messages. And we're given this solution — people always say, 'Oh, just cut yourself off, use technology less'. But working with computers, it's just not an option. It sounds good, a lot of us have tried to get off Facebook at some point, for example, but it's not practical. "And so we wanted to tackle it at the core, and find a way to actually boost people's focus so they feel more control. The way that we do that is give people a greater awareness of how their mind changes. When you're fatigued, when you're distracted or if you are focused, we tell you." 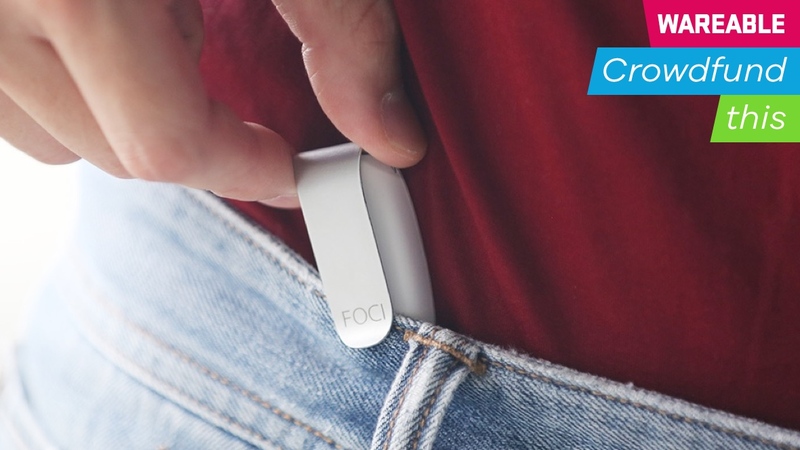 But how exactly does the Foci do this, simply by clipping on your hip and tracking you when you're sat down? Well, as Adams explained, the machine learning algorithm developed by the small team in Cambridge is the power behind the tracking, using research into neuro-respiration and breathing techniques to help determine the state of the user. The data collected is then used to personalise the experience to the individual user over time, something Foci AI says can take as little as four hours. "It's all tracked, basically, by leveraging motion and artificial intelligence," he said. "We've got a very simple sensor in the wearable and that tracks your diaphragmatic breathing. And for about 20 years, there's been some serious research into neuro-respiration and a correlation found between your breathing and your cognition. The problem with trying to track this is that it's hard to do outside of a laboratory, though. So the advancement we've made is using machine learning in a tiny processor in the wearable. "You clip it in when you start working. Say, if you're sat at your desk trying to focus – maybe you see something on Twitter, maybe you see a text pop up. If that happens, Foci prompts you to focus with alerts." It's not just the wearable's buzzes that aim to train you into better focus, either, with Foci also connecting to a smartphone app and updating in real time through a graphic of a fluid ball, shown below. Colours change depending on the user, with red indicating stress, blue denoting calmness and yellow showing when the user is focused. The ball will also change if you're distracted, naturally, and even when you're in a flow or stressed. All these states are then recorded throughout the day, allowing you to look back and assess where and when you were at your most focused. And through the startup's testing at the University of Cambridge, Adams indicates that it's been surprising to see the positive effect this has had on those trying to study. "We found that, when the testers would get distracted, they would refocus out of guilt, and then get this greater awareness of being distracted. And you need that, because it's not like being hot and cold, happy or sad, being distracted is a bit of different feeling; it can sometimes be a little harder to work out in your own head," he continued. Things are still in the early stages for this startup, but, as Adams told us, the team is already thinking about how it will help to tackle the problem of distraction in the long-term. "We think there's a pretty universal appeal to having better focus. I think there's huge possibilities in education, and, generally, fighting digital distraction is a problem that isn't going to end with this generation – it's probably something that's going to get worse before it gets better," he said. Unlike many campaigns diving into the choppy crowdfunding seas, Foci AI is presenting potential backers with something truly innovative. That alone won't necessarily make it a success, but it is refreshing to see a wearable take on one of technology's fastest-growing problems. Having a healthier relationship with connected devices is a trending topic, too – our US editor-at-large Hugh recently talked about the challenges of living with a smartwatch in the current age of anxiety, and, simply put, it's not easy. Like the folks at the University of Cambridge, we're currently putting Foci through its paces and deciphering whether it's able to use our breathing to figure out whether we're being distracted, and then crucially make us more aware of it. We'll be sharing how locked in we managed to stay in the coming few weeks, but, the reality is, even if Foci can help just a small number of people, it's a success story for the world of wearables. And if you failed our test and didn't make it to the end of this without glancing away or replying to a message, it might be worth giving Foci an extended look on Kickstarter.